Graph Pads Gormack A3 1mm - $9.99 - 50 leaf C102X Gormack quality graph pad in 1mm grid. Graph Pad Gormack A3 2mm - $9.99 - 50 Leaf C052X - Gormack quality graph pad in 2mm grid. Graph Pad Gormack A3 5mm - $9.99 - 50 Leaf C021X - Gormack quality graph pad in 5mm grid. Graph Pad Gormack Isometric A3 - $11.99 - 50leaf L110X - Gormack quality graph pad in Isometric grid - each side of the grid is 6mm. 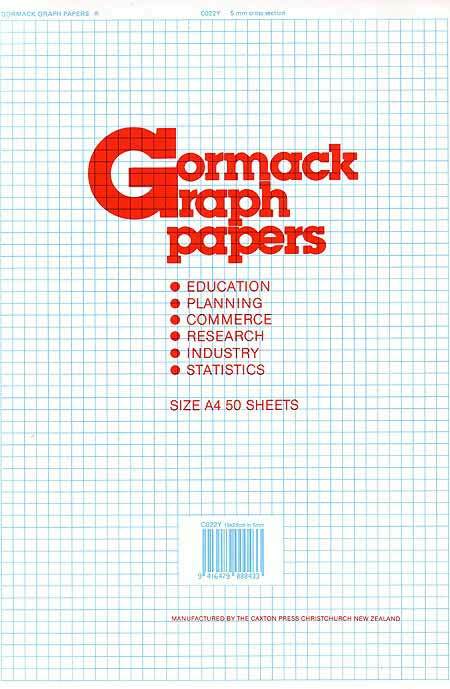 Graph Pad Gormack A4 1mm - $5.94 - 50 Leaf C101Y. Graph Pad Gormack A4 2mm - $5.94 - 50 Leaf C051Y. Graph Pads Gormack A4 5mm - $5.94 - 50 Leaf C022Y.